A 10th-generation Washingtonian, Connie has a lifetime of local market knowledge, helping sellers in all areas and all price ranges. In addition Connie has lived all over the world (Japan, Australia, UK, New York City) in more than 30 residences, so she understands the demands on buyers, helping them to sort through the myriad of details required to select and buy a home at the best possible price. She prides herself on thinking out of the box, really looking for the best place for each of her buyer clients. Her family network in Washington, DC, is extensive. 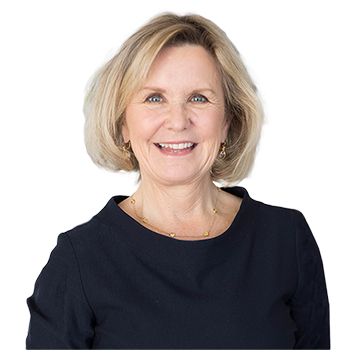 Connie has been a licensed real estate agent since 1987, formerly with the Corcoran Group in New York, and with Washington Fine Properties since 2000. Prior to her real estate career, Connie worked in broadcasting with ABC News 20/20 and was Creative Director at Burson Marsteller Public Relations. She is also the Founder/President of Australian Great Estates, a premium wine-importing company. Her journalism and marketing background give her an extra edge in assisting sellers in maximizing the sale of their home as she blogs and tweets often. She is the mother of three adult children, working with many of their millennial friends. Connie is currently installing a green roof on her renovated, mid-century modern house. She is an avid collector of art, passionate about Washington, DC, being a cultural hub. Connie cooks and entertains often and loves gardening. She is a member of the Aspen Institute Society of Fellows, regularly attending the Ideas Festival. She plays golf, swims and snow skis, and loves to hike. Each September she swims in the one-mile open water swim for Swim Across America in the Chesapeake Bay and is captain of her team mELLENoma, which collectively raised $450,000 in the first year. Connie helped us buy our dream home in the Palisades neighborhood of Washington, DC. Three things about Connie make her a fantastic realtor. First, she is incredibly knowledgeable about Washington. She has lived in the city for most of her life and is a multi-generational Washingtonian—something she brings to bear in her work. Second, Connie truly listens to her clients and internalizes their particular styles and preferences. This led us to not only find the house we ended up buying, but also several others that were genuinely great. Finally, Connie provides top-notch client service. We needed to undertake a remote house hunt under tight time constraints, yet Connie didn't miss a beat. She's responsive and thoughtful. Best of all, she's fun! Because of Connie, our quick trips into DC were both productive and enjoyable. Connie gets our highest recommendation! She is the best. Connie is very attentive and a great listener. She is a tenacious negotiator and makes a stressful process feel seamless and fun. I would recommend Connie for any first-time home buyer"
A long-time realtor with years of experience, Connie's results speak for themselves. She sold our home in less than two weeks at a price point that, frankly, exceeded our own aspirations. Connie was also integral in the strategy process. This became particularly important in a highly competitive purchase environment. Our uniquely structured offer for our "dream home" helped us not only close the deal but also prevented a bidding war and reduced the chances that we might overpay. Connie was professional, responsive, transparent, and made the entire experience fun and rewarding. We will recommend Connie to all of our family and friends looking for a realtor! I worked with Connie Carter as a diplomat at the Embassy of Kazakhstan in DC on a deal to purchase a new residence for our Ambassador. Connie was extremely successful in finding a beautiful property that fully matched all our requirements. She was effective negotiating a complicated deal in a way that was both acceptable to the seller and cost-efficient for the Embassy. I strongly recommend Connie Carter for real estate transactions in the Washington metropolitan area and beyond. Deputy Secretary to Ambassador from Kazakhstan to the U.S.
Connie went above and beyond for us throughout the whole entire process. Our home-buying process was not the easiest one, but Connie remained a strong pillar of support throughout all of it. Not only did she cater to the whole entire family, but she truly had our best intentions at heart. As international buyers, Connie made our purchase definitely more enjoyable, and we have told all of our friends about her for their next purchase. For our next home sale, we will go with no one else but Mrs. Carter! We hired Connie to sell our client�s home after an extensive search for a high-quality agent focusing on high-end properties in Georgetown and Observatory Circle. We looked closely at thirteen prominent agents covering those areas, interviewed three, and selected Connie after an extensive analysis. To say that our client and my firm were pleased with Connie is a major understatement. The work that Connie did far exceeded everything we could have possibly expected and under challenging conditions. Our client was not living in the home, and Connie arranged for all staging and fixing up of the residence. Moreover, she kept fixing-up costs very low yet was able to obtain a sales price that exceeded, by a large margin, the price estimated by virtually all of the other agents we considered. Finally, Connie was able to handle everything, and I do mean everything, from the time she was retained until sale, within about two months, all for a home that required a substantial amount of work before sale. We found Connie to be smart, hard working, proactive, efficient, and fun to work with. We highly recommend her as a real estate agent and we will certainly use her again. Connie Carter is impressively knowledgeable about the DC area and helpful in connecting clients with homes that match their needs. We found her to be efficient, persistent, accommodating, and intelligent. With her years of experience she has reliable connections from appraisers to contractors. That she could call in an appraiser immediately with a "hot house" was important. She was always on time and had interesting stories. We were pleased with the final closing on our house. Connie was very knowledgeable about the neighborhood, comps and our building where we were selling our apartment. She worked with me on a very tight schedule. She was incredibly responsive. We were very happy with our experience with her. I couldn't recommend her more highly. Connie has been great to work with, selling two houses for us in the last three years. She's a real pro, not only covering all the bases, but offering creative suggestions as well. She has been a joy to work with because of her professionalism and follow-through. She has helped us on both the buying and selling side, over three transactions. Connie also made valuable suggestions and was always looking out for our best interest. We enthusiastically recommend her. Connie is a highly motivated real estate agent with excellent knowledge of the DC market. It was a pleasure working with her to purchase rental units. Connie is incredibly tenacious and knowledgeable. She works tirelessly for her clients and is very personable. She has a wonderful rapport with her clients and is honest when communicating expectations about the realities of the market. We were very pleased with the way she helped us in the purchase process! Connie found me a place to live in an afternoon, after I had been searching for months. She thought outside the box to solve what seemed to be a simple case of market dynamics, and delivered us a home. Connie's knowledge of the DC Metropolitan Real Estate market ensures that her buyers will purchase at a fair price and sellers will be positioned well to move their property in a timely manner and at a valuable price. Connie is an extremely hard worker for her clients with great attention to detail. I have worked with Connie's clients over the years, and they always complete a transaction with the highest praise for her great work. To buy and sell Real Estate in this market you must work with a real professional, Connie will be an excellent choice to help you, she is a real pro. Connie Carter is an outstanding realtor. We worked together to assist a mutual client purchase his first home. He had very specific requirements and took quite some time to make a decision. Connie was very patient with him and worked diligently until the right property was identified and our client was satisfied. She is quick to respond to any request, is excellent with negotiating pricing and terms and has a very strong understanding of the market. I would highly recommend her to another client as well as hire her personally if I were buying or selling my own home. Connie was always clear and proactive, helping to set a realistic selling price based on market conditions, managing the staging of the house to suit today's buyers, arranging open houses and showings, engaging creatively in negotiations to get the best price and following through to the closing to make sure everything went smoothly. She is terrific. My partner and I used Connie to sell our 2BR 2BA condo last year. Connie is one of the most sincere, smart, responsive, resourceful and results-oriented realtor we have ever used. Even if you use her to sell your home in a neighborhood that she doesn't know that well, she finds ways to connect with other agents who do and she gets the job done. I HIGHLY RECOMMEND Connie. Connie helped with the purchase of my first home. We worked together for about a year, and I found her to be a great asset. She has a great sense of style and knows everything about Northwest Washington. Connie knows the market and has excellent taste. She really helped me and my family find the perfect house for us and she found it before it ever came on the market, thanks to her great contacts at WFP. She also sold our apartment in good order and in a timely way. He pricing advice was dead on. If you are looking for someone who is plugged in, knows DC "quality" real estate like the back of her hand and the people who own it, Connie is your person. She's THE BEST IN TOWN at finding the right property for you for the right price (and at the right time). She's dedicated to excellence, a proven professional, and a great friend. Thanks to Connie we live in a home we love. We look forward to someday working with her again! You will too! Connie has been great to work with, selling two houses for us in the last three years and helping us purchase our new home. She's a real pro, not only covering all the bases, but offering creative suggestions as well. I highly recommend Connie for any residential real estate needs. Connie helped me sell a house in the spring of 2008, as the market was cracking and financial markets were going haywire. She kept her head throughout the unnerving market environment. She was entirely professional in the process of showing the house to potential purchasers, held numerous open houses, gave good pricing guidance and showed great enthusiasm for marketing our house in an effective way. We were very satisfied with the final outcome. Selling your home is a stressful event. Connie helped me through each step of the process with her on-point and thoughtful recommendations. The end result happened quickly and with a whole lot less stress than anticipated. Her personality, quick wit and knowledge of the subject matter were all fabulous. Anyone would be a fool not to hire her!